CHARLOTTESVILLE, Va. -- Jordan Ellis ran for a touchdown and Virginia kept No. 16 Miami's high-powered offence from ever getting going in a 16-13 victory Saturday night. Ellis scored on a 7-yard run in the first half and Brian Delaney kicked three field goals for the Cavaliers (4-2, 2-1 Atlantic Coast Conference). Miami appeared to have stopped Virginia on a third-down run in the final minutes, but a personal foul call against Tito Odenigbo kept the drive alive and the Cavaliers ran out the clock. Miami came in averaging 41.5 points and after an emotional victory last weekend over Florida State. In that game, the Hurricanes trailed 27-7 before N'Kosi Perry threw four touchdown passes in a 28-27 victory. Perry lasted only four series against the Cavaliers and was pulled after throwing his second interception. Students rushed the field following the victory, Virginia's first against a ranked opponent in four years. Miami: One week after leading the Hurricanes to their biggest comeback victory in the history of their series with Florida State, Perry was removed after four series. Rosier played the rest of the way and was 12 of 23 for 170 yards with one interception. 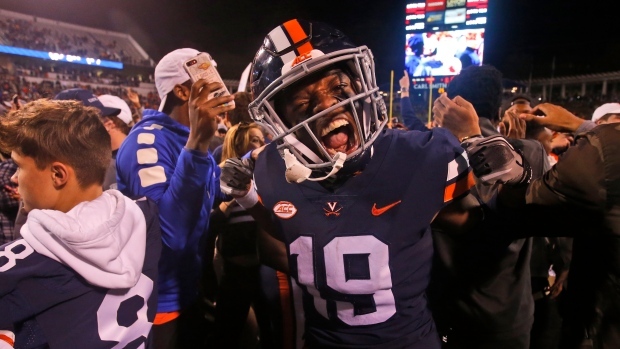 Virginia: The Cavaliers overcame three first-half interceptions by Bryce Perkins and may have stamped themselves as players in the Coastal Division race with the victory. Miami has next weekend off and plays at Boston College on Friday, Oct. 26. Virginia goes on the road to face Duke.